Get satisfied, not stuffed, this Thanksgiving! Our team shares their lightened up version of classic Turkey Day eats. You'll enjoy all the traditional flavors you love without the guilt! For every 1 cup of heavy cream called for, try 2/3 cup of skim milk and 1/3 cup of olive oil. You'll lower the saturated fat and save on calories. 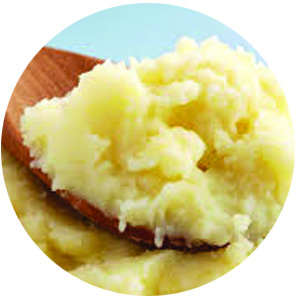 Or better yet, replace the potatoes with cauliflower! Want to go dairy-free? Skip the milk and cream altogether, replacing with chicken broth and a little bit of olive oil (1 tbsp olive oil for every 1/2 cup of chicken broth). Green bean casserole is a holiday favorite, with a healthy dose of cream of mushroom soup and generous topping of french fried onions. Want to lighten it up? Instead of baking a casserole, simply satuee your green beans in a little bit of butter and top lightly with the fried onions. You can save 140 calories and 9 grams of fat per cup! Or consider replacing the dish altogether with roasted brussel sprouts! Roasting them will provide the same light crunch as the casserole's fried onions. The traditional sweet potato casserole calls for canned or mashed sweet potatoes topped generously with mashmallows. It's hard to deny its deliciousness, but sweet potatoes are naturally yummy and sweet on their own! For a sweet *and* savory dish, try this instead: Boil your peeled sweet potatoes until fork tender. After draining the water, mash them with chives, butter, goat cheese, parsley and a bit of salt and pepper. There are plenty of stuffing recipes out there, and everyone seems to have their favorite. 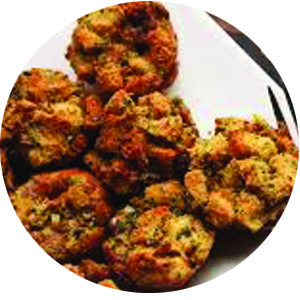 Instead o changing up your recipe, simply keep portions at bay by baking your stuffing in muffin tins. These stuffing muffins ("stuffins") are not only adorable, but will also prevent your guests from stuffing themselves! Any good Thanksgiving meal ends with pie... but not all pies are created equal! 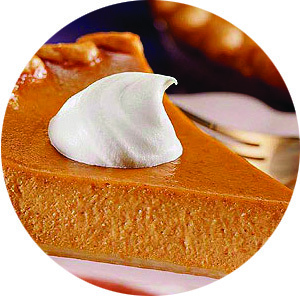 Swapping a slice of pecan pie for pumpkin will save you more than 300 calories, 16 grams of fat and 20 grams of sugar! And bonus - pumpkin provides a generous dose of antioxidents vitamin A and lutein!